The recent domestic violence-related shooting at the Frontenac Schnucks inspired Kat’s co-workers to help. Kat’s story was covered extensively by local media after her estranged husband shot her 10 times as she was heading into Schnucks for a shift. Kat’s coworkers wanted to honor her as she works to recover, and the Bags 4 My Cause Program was the perfect opportunity. 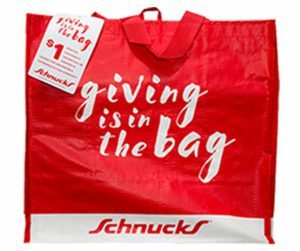 Every month, Schnucks locations pick a local charitable organization as the recipient of proceeds from all “Giving Bags” sold. This is a part of their Bags 4 My Cause program and the designated organization receives one dollar from every bag sold. In the month of May, Safe Connections was selected as a way to honor Kat. Co-workers of Kat’s said she is”friendly and a hard worker and loved to talk about her grandkids and was excited to have another one on the way.” If you’re looking for a way to help, consider purchasing a Giving Bag at the Frontenac Schnucks (map it) and donating to help cover Kat’s medical bills. Thank you to the store manager and staff at the Frontenac Schnucks for supporting Safe Connections in May! Please purchase bags no later than Wednesday, May 31.